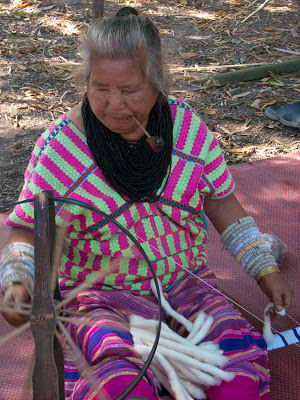 Mai of Junhom Banton has kindly invited us to join her at a unique textile festival at a nearby village of Karen people (known in Thai as Kaliang.) 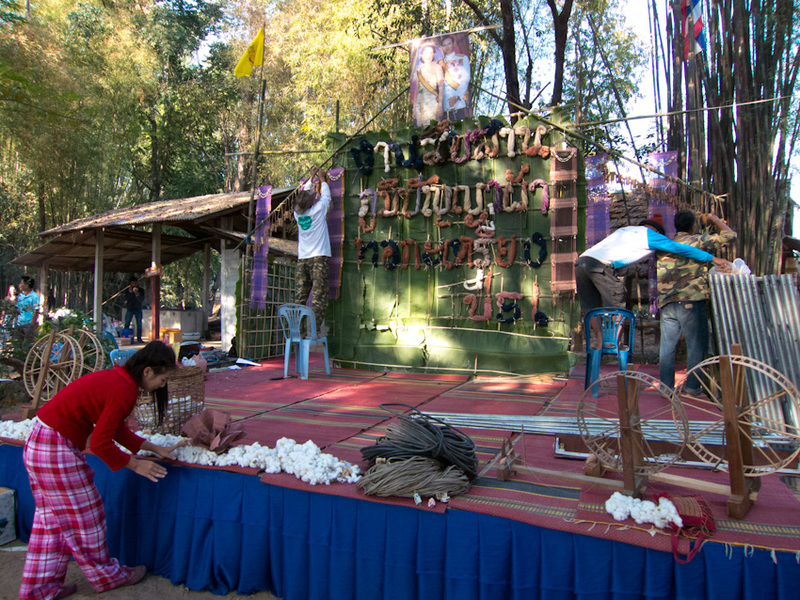 The festival is being sponsored by Ban Lai Kaew Weavers, a long-standing fair trade textile group that creates beautiful, naturally-dyed textiles on backstrap looms. When we arrive, weaving exhibits have already been mounted in some of the traditional buildings that dot the site. 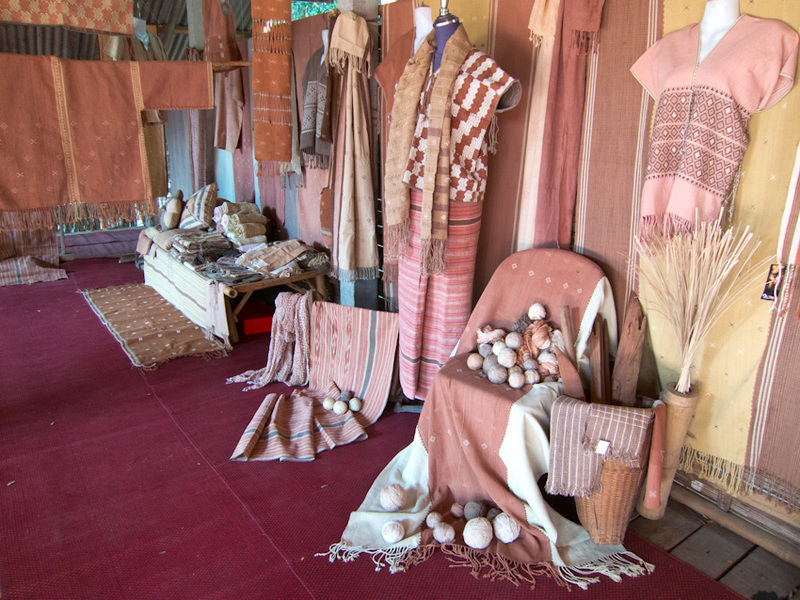 In one, there's an extensive exhibit of Kaliang textiles, dyed with the traditional natural dyes that are being revived here in Doi Tao district. Nearby there’s also a display of jok (elaborate supplementary weft-patterned weaving) for which the neighbouring district of Chom Thong is famous. A large stage has been constructed in the usual country fashion – a wooden platform resting on steel barrels. The platform is then covered with mats. 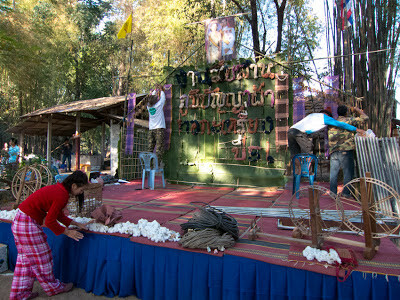 Today the festival name, crafted out of handspun cotton skeins, hangs above the stage. 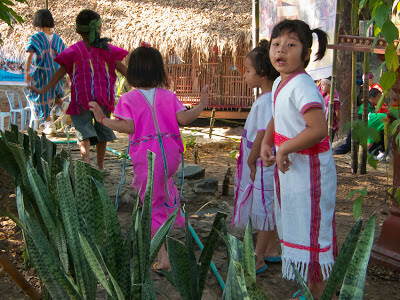 Children, in traditional Kaliang clothing, gleefully run about the site, blowing off some steam before their dance performance. 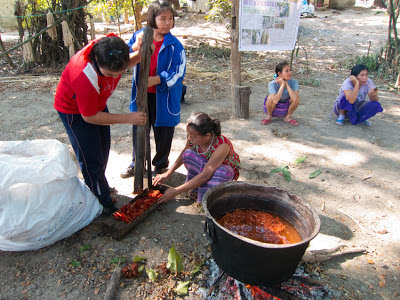 We wander to an open area, where women are preparing a dye bath with annatto (kamset in Thai, bikkii in Kaliang). Young women from local schools, here for a cultural learning day, are invited to smash the pods with a large wooden pestle in a hardwood trough. 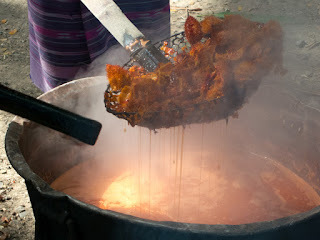 They’re instructed by an older woman to leave it to simmer for 1 hour. 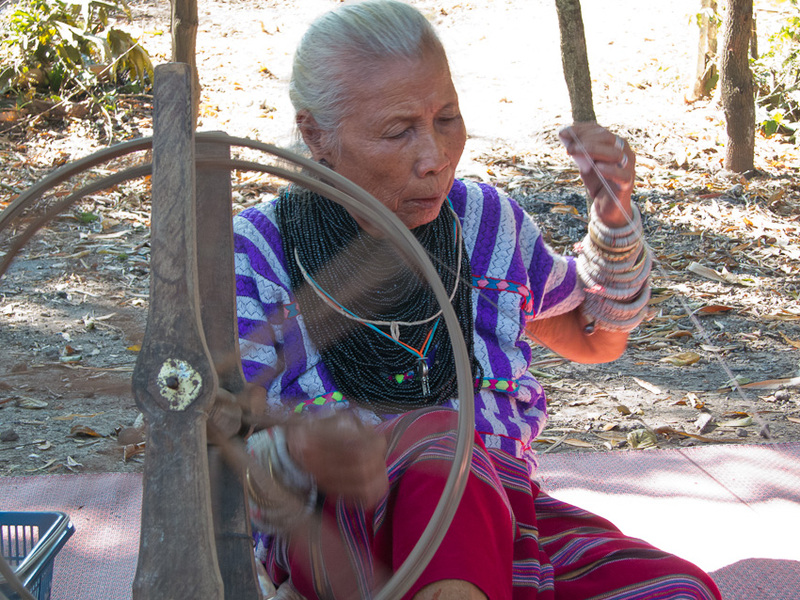 Nearby, a bird-like grandmother has begun to spin cotton on a traditional wheel, smaller than the Lao version we've seen by the Mekong, but otherwise the same. 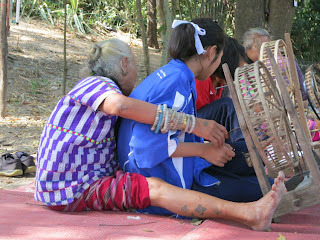 A larger, old woman soon joins her with another wheel. Both wear layers upon layers of black beads around their necks and larger white beads on their wrists. The tiny woman chews betel, the larger smokes a pipe, as many Kaliang women do. While elaborately patterned on a backstrap loom, the traditional Kaliang clothing is simply constructed, similar to a Mayan huipil and corte. The top is seamed vertically and left open in the middle, while the skirt is seamed horizontally. Colours are now usually made with chemical dyes, although the Kaliang’s natural dye traditions are being revived and, today, are being celebrated. One of the many young women watching, all wearing their school’s sports day attire, is persuaded to try her hand at spinning. The thread soon breaks and the first grandmother comes to her rescue. 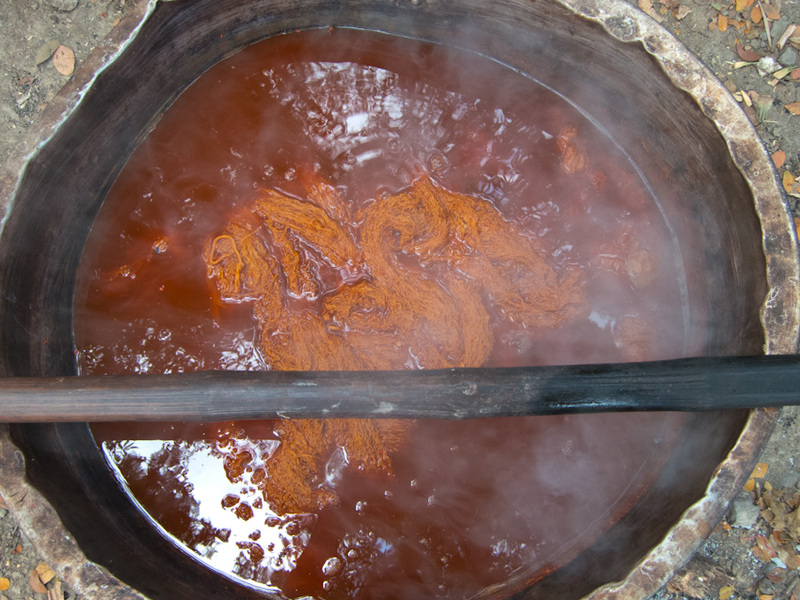 Back at the dye pot, the students learn to strain out the annatto with a tool that looks like a giant wok strainer. 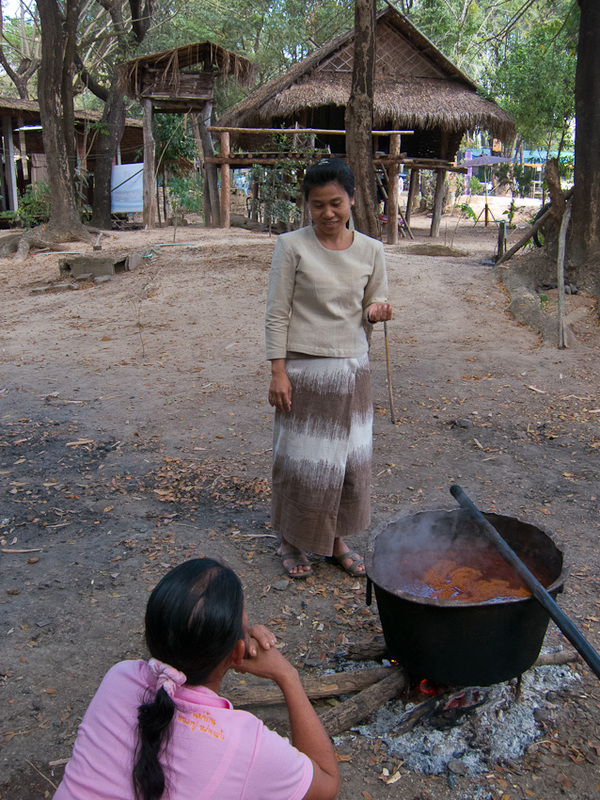 An older woman adds water soaked with yahoo (ash water) for mordant. Then they add the skeins of handspun cotton and simmer over the fire. After another 30 minutes the yarns emerge in the deep orange usually associated with Buddhist monks, although this traditional and natural colour has much more depth and substance than the brighter and thinner orange more commonly seen now. Two pick-up trucks pass by, filled with more students. They shout to Ellen, who is wearing a traditional dress worn by Kaliang maidens, which she was offered upon our arrival. Ellen accepts their offer and climbs aboard. 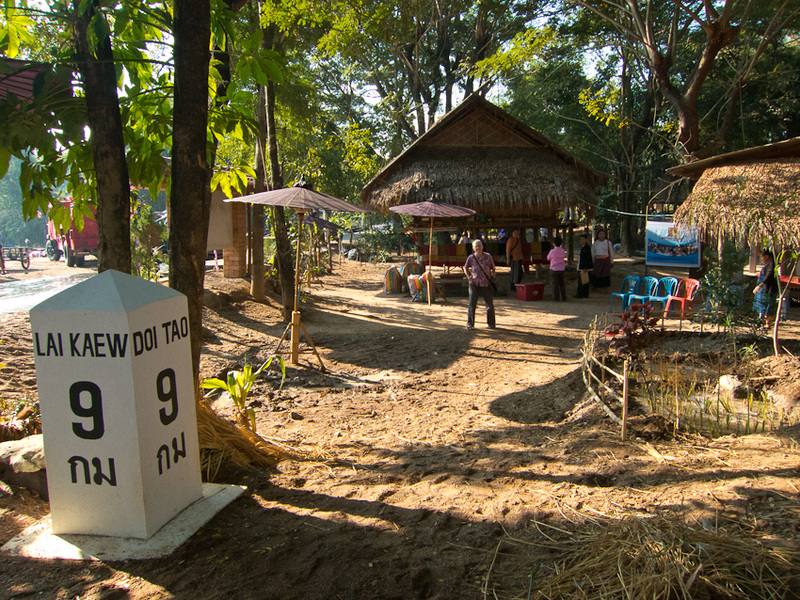 They drive for about 10 minutes and arrive at a field sparsely populated with cotton plants. 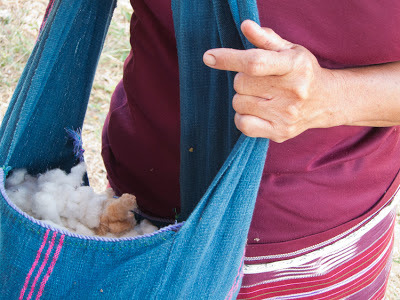 The noon-day sun is hot, but Ellen happily picks cotton – both white and brown varieties – side-by-side with urban students from Bangkok and others from Kaliang villages further north. She wonders if any of them will be inspired to continue these traditions. After Ellen returns from her outing, we return to the display of naturally dyed backstrap weaving. Tucked on a low shelf, we find lovely placemats with designs that are an appealing blend of homespun and abstract-modern. We sort through the pile and choose dozens that will make their way later this year to a table near you. At the same display, we are pleased to bump into Ajarn Nittaya Mahachaiwong from Fai Gaem Mai of Chiang Mai University. (That’s the Cotton and Silk Project we’ve worked with for years to source Eri silk). Today she’s wearing an extraordinary coat fashioned from Kaliang fabric. She’s here to participate in the technical discussions that are part of the day’s events. However, the talks are intended for the local participants and our ride is about to depart, so we say thank you to our hosts and set out for the bus station with our bags of treasure.